1) It has to be completely quiet. While I like to have the television on, I must mute it. Tim: Me too, Laura, although I don’t have the television on. I like to have a hot drink to hand. It helps keep my anchored down to my chair and provides me with a mini reward every few minutes! 2) I have to study when I am well rested so mornings are better for me. My job is high pressure and stress so studying on week nights is limited because I am tired and distracted by thinking about my day at work. I usually try to start studying on Friday night, then go to bed early to get up and study most of the day on Saturday. You mention that you study most of the day on Saturday. How do you organize that? I find time boxing is a helpful way to break up long periods of focused study. The idea is simply to select a length of time you feel like committing to your work and then taking a break after doing it. 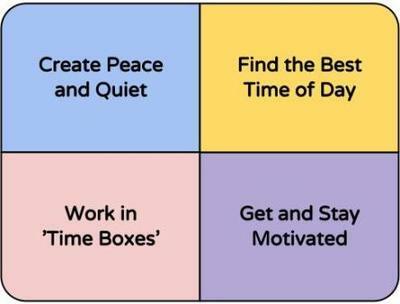 The key is to choose each ‘box’ of time according to how you feel. 3) My family, the phone and housework are my biggest distractions. Perhaps the best way to deal with these is to use a combination of the points already made. 4) I am motivated solely by my determination to finish my degree. Motivation is the fuel that drives us towards our goals. But, as you’ll know, it wavers according to changes circumstances, even on a daily basis. Have you got your specific goal written down on paper? Posting it somewhere you’ll keep seeing it (preferably along with some sort of associated picture to make it feel more real) is a powerful way to help maintain focus and motivation. It works for me, anyway!